Despite the many setbacks we all heard about during production, Solo: A Star Wars Story manages to be an exciting film perfect for the summer blockbuster season. Convincing fans of the franchise to see Han Solo played by anyone other than Harrison Ford was a tough task but Alden Ehrenreich excels thanks to the charisma, naivety, and arrogance he brings to the character. We’re seeing a different side of Solo in this entry, one that helps shape him as a character in later installments thanks to the many adventures he goes on. The plot of the film doesn’t have much going for it but the action set pieces are enough to intrigue viewers. The mystery behind the many stories Solo told in the original trilogy is what made the character so compelling. Here we’re shown how he met his noble sidekick Chewbacca, his friendly foe Lando, and the beloved Millennium Falcon. Sometimes the unknown is far more interesting which is the case here as a few stories lose their luster as they go into more detail about them. Being aware of the outcome results in the stakes feeling hollow at times but that doesn’t take away from the full throttle tone of the film. Solo is a heist movie at its core, packed with high octane vehicle chases of all sorts. The film is at its best when Han and the gang are stuck in an unfortunate circumstance and have to claw their way out of it. There are moments of unpredictable pacing where adventure is followed by extended lengths of downtime. Knowing that upwards of 70% of the film was reshot, Ron Howard and his team should be applauded for salvaging the film. There are notable flaws in the final product but Howard was able to piece it together to make an enjoyable entry in the Star Wars franchise. Many of the new characters aren’t given the opportunity to be fleshed out, instead they’re given one or two specific tropes that they’re attached to throughout. Donald Glover slides into the role of Lando with ease, capturing the same smooth talking swagger Billy Dee Williams had. Paul Bettany plays Dryden Vos, the menacing gangster that Solo is working for. The antagonist doesn’t get much screen time which results in him coming off as ‘bad guy doing bad thing to further advance himself”. Woody Harrelson, Emilia Clarke, and Thandie Newton are all good with what they have to work with but don’t offer up anything new or memorable to the Star Wars lore. Joonas Suotamo is a standout as Chewbacca, showing off the youthful side of the Wookie. 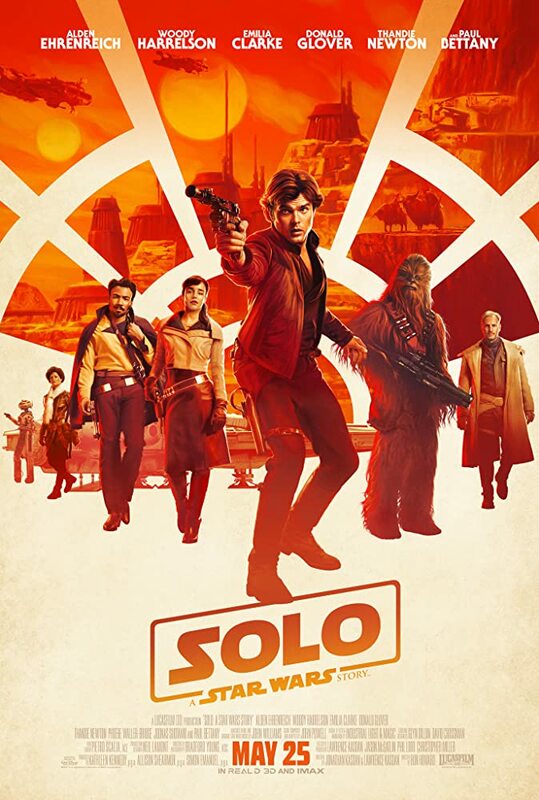 Discussions will be had about whether or not the film was necessary but Solo: A Star Wars Story has enough action and comedy suited for the franchise that will please viewers. The new trilogy has always resulted in speculation and fear of what to expect, with Solo you’re able to kick your feet up and enjoy something different without being too invested in the final outcome. Previous Previous post: CONTEST: Win Advance Screening Passes to WON’T YOU BE MY NEIGHBOR?